As I mentioned before, I’ve worn a MedicAlert emblem for decades. Like everyone else, MedicAlert has been changing with the times and offering a lot more choices than the bracelet or necklace they had when I first signed up. 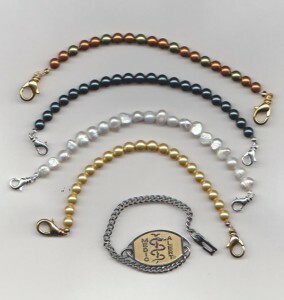 Their latest offering is beaded bracelets, featuring Swarovski beads or pearls. I happen to like the look, but (a) the choices are limited to what they supply and (b) they’re expensive. Note, I do not for a moment wish to imply I’m criticizing MedicAlert for their prices. They offer a fantastic service and not one of their emblems is unfairly priced. It’s just that some of us can’t afford the fancier offerings. So, herewith I offer up instructions for creating your own beaded medical bracelet. Take the emblem off the chain or stretch band. Measure the emblem’s bracelet, including the attachments. Cut a length of Acculon this length plus 1″. Slip a crimp bead onto the Acculon, thread it through a clasp and back through the crimp bead and crimp firmly close to the clasp. Thread on your beads, in whatever pattern you like. I’ve only made fairly plain bracelets so far, but I plan to do a lot more creative work next time around. 🙂 Hold the bead strand up against the existing bracelet from time to time to check for length. 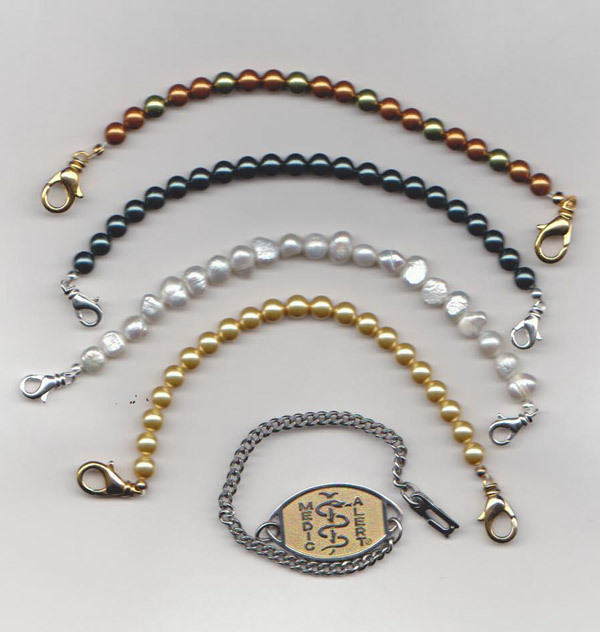 When the length of the bead strand plus a second clasp will equal the length of the original chain, put a crimp bead on the wire, slip it through the clasp, pull tightly and crimp close to the clasp. Trim off excess wire, and add crimp covers if you’re using them. Done! To wear the bracelet, clip one lobsterclaw on one side, wrap the beads around your wrist and clip the other lobsterclaw to the other side of the emblem. It may take some practice to do this easily, but once you get the hang of it it’s easier than the standard medical bracelet clasp. So, now you can wear your medical bracelet in style! I wore the real-pearl one to a dressy occasion not long ago, with a matching pearl bracelet on the other wrist. You’ll have plenty of beads left over from this project, so you can do the same.